Baby Milk Action has today sent an open letter to the Executive Director of the UN Global Compact, George Kell, over the failure of the Global Compact Office to hold Nestlé to account for breaking its stated commitment to abide by the Global Compact Principles. Nestlé is a sponsor of Global Compact events, which Baby Milk Action describes as a self-evidence conflict of interest. Last week, the US and EU opposed moves for legally-binding measures to hold corporations to account at a meeting of the UN Human Rights Council, citing the Global Compact as an alternative approach. For the past five years, Baby Milk Action has been pursuing complaints against Nestlé for violating the Global Compact Principles in the way it markets its baby foods. However, the Global Compact Office refuses to take action specified in so-called Integrity Measures, or to explain its refusal. Left, Nestlé promotes its infant formula as the ‘natural start’ (and that it is the ‘gentle start’ and ‘protects’ babies) – practices executives at the highest level of the company defend. Babies fed on formula are more likely to become sick than breastfed babies (the true ‘natural start’) and, in conditions of poverty, more likely to die. These and other Nestlé practices violate UN World Health Assembly marketing requirements and the Convention on the Rights of Child (particularly, Article 24 (2) (e)), and so the Global Compact Principles. Baby Milk Action welcomes the fact the UN Human Rights Council voted to set up a working group to draft a Treaty to hold corporations accountable for human rights abuses as it states its experience has shown the Global Compact to be ‘worse than useless’. Mr Brady has written on holding corporations accountable as a member of a UN Task Force on International Dimensions of the Right to Food under the UN System Standing Committee on Nutrition. Proposals from the Task Force on protecting the right to food are presented in the book Global Obligations for the Right to Food (published in 2008), and include possible approaches for legally-binding measures to hold corporations accountable (chapter 4, Mike Brady). We are contacting you to raise the failure of the UN Global Compact Office (GCO) to respect the Global Compact Integrity Measures and to confirm whether you are aware of these failings. We have been reporting egregious violations of the Global Compact Principles by Nestlé to the GCO over the past five years in accordance with the Integrity Measures, but have found it to be a futile exercise. In its latest message to us of 11 June 2014, the GCO is again stating it will take no action. Are you, as Executive Director, aware that the GCO’s refuses to take the action specified in the Integrity Measures and do you endorse this position? In the past, we have requested clarification as to why it will not take the action it could or should take under the Integrity Measures, quoting the actual text in our letter dated 29 August 2011. The GCO’s response on 10 November 2011 merely stated: ‘Regarding the letter addressed to the UN Global Compact, we do not plan to provide a point by point response’. We have tried writing to the Global Compact Board and Advisory Council via the GCO. The GCO told us (21 December 2011): ‘The Global Compact Board is kept up to date of all matters raised under the integrity measures. We do not forward them individual letters.’ We have received no response from the Board or Council. Accordingly, we are making this letter public and will gladly report your response to it. 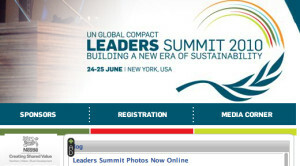 The Global Compact website claims the initiative is ‘voluntary yet accountable’. the Global Compact posts misleading Communications on Progress from corporations to its website with no form of checking. the GCO has received our evidence of violations of the Global Compact Principles and Nestlé’s refusal to end them, but does not take the action it could or should take under the Integrity Measure. We are in on-going communication with Nestlé and have demonstrated to the GCO that executives refuse to end practices that violate the Global Compact Principles. The GCO should surely proceed to ‘review of the nature of the matter submitted and the responses by the participating company’ and then ‘remove that company from the list of participants and to so indicate on the Global Compact website’ as set out in the Integrity Measures. One can only conclude that GCO is unwilling to apply the Integrity Measures due to the self-evident conflict of interest of Nestle being a sponsor of Global Compact events [example from 2013 and, above, from 2010], making the GCO financially indebted to the company. To keep the GCO updated on Nestlé’s on-going violations of the Principles we wrote to the GCO on 14 March 2014, attaching our latest correspondence with Nestlé (dated 3 March). We provided evidence of misleading statements included in the Communications on Progressposted to the UN Global Compact website (which bring the initiative into disrepute) and practices that violate human rights (which break the Global Compact principles). With regard to the attached letter addressed to you from Nestle’s in response to your letter dated 3rd March 2014, we would kindly request that you please inform us whether you are satisfied with the content of the communication or if there are any other issues that should be addressed by the company. If not, please note that the matter will be considered closed by the Global Compact Office. If you read Nestlé’s letter you will realise that it is unsatisfactory as Nestlé is refusing to take action to stop the violations of the Global Compact Principles we have reported to it. Rather than closing the case, it would be welcome if the UN Global Compact can provide the ‘guidance and assistance’ to Nestlé referred to in the Integrity Measures, encouraging it to take ‘actions to remedy the situation that is the subject matter of the allegation in order to align the actions of the company with its commitments to the Global Compact principles’. Please refer back to our letter of 3 March for the details. We have examined the matter and, as of now, we do not see any further role for the Global Compact in this process. Unless you have any additional issues that you would like to raise with the company for their response, please note that we will consider this matter closed under our Integrity Measures. Do you agree that the GCO has no role to play in encouraging participating corporations to stop violations of the Global Compact Principles when executives have indicated they will continue with these practices? Do you agree that corporations should continue to be listed under these circumstances? We understand from our communication with the GCO that no company has ever been excluded for violating the Global Compact Principles following a complaint. Companies have been excluded for failing to provide Communications on Progress, but as these reports are posted to the Global Compact site even when they are misleading (as in the case of Nestlé), they are of little value in any case. We look forward to your response to the questions raised in this letter and the clarifications requested in our letter to the GCO of 29 August 2011. We will be publishing this as an open letter and will add your response, if and when we receive it. CC: The Honourable Ban Ki-Moon, UN Secretary General. Elena Bombis, Advisor, Legal & Policy, Supply Chain Sustainability, UN Global Compact.